Where is Papua New Guinea located ? Papua New Guinea is an Oceania’s island nation situated partly on the island of New Guinea, and partly on many other islands of the Southwestern Pacific Ocean. Who are Papua New Guinea’s neighbors ? Papua New Guinea borders Indonesia to its west, Solomon Sea to its east, Bismarck Sea to its north, and Gulf of Papua is to its South. Also, Australia lies further to the south of Papua New Guinea. Which island of the country is shared with Indonesia ? The island shared with the neighboring Indonesia is Island of New Guinea. What is the capital of Papua New Guinea ? Port Moresby is Papua New Guinea’s capital. It is also the largest city of the country. Who is Papua New Guinea’s Prime Minister ? Peter O'Neill is the Prime Minister of the country. What is the motto of Papua New Guinea ? The motto of the nation is ‘Unity in Diversity’. What is the area and population of Papua New Guinea ? Papua New Guinea covers a total area of 178,703 square miles and as per the 2011 estimate, 7,059,653 people reside in the country. How many languages are listed in Papua New Guinea ? There are 848 languages listed in the country and the ‘Enga’ is the most-widely spoken languages with 200,000 speakers. Melpa and Huli are other widely spoken languages. These indigenous languages have been classified in two broader groups which are Papuan and Austronesian languages. The official languages of Papua New Guinea are Tok Pisin, English, and Hiri Motu. What percentage of the population resides in the urban areas of the nation ? Around 18% of the total population resides in the urban centers in Papua New Guinea. What was the country’s former name ? 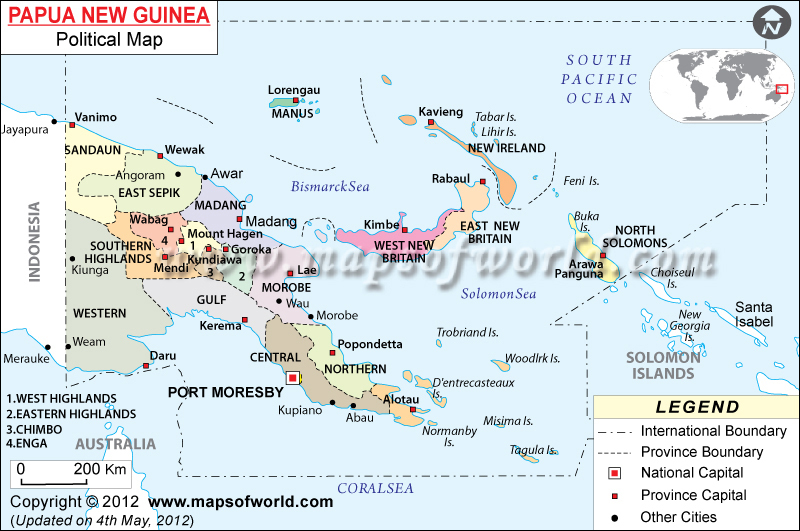 Territory of Papua and New Guinea was named as Papua New Guinea in 1971. What is Kuk Early Agricultural Site ? Kuk Early Agricultural Site is an archeological site and also a UNESCO World Heritage Site. It has 116 hectares of swamps in New Guinea’s western highlands 1500 meters above the sea level. When did Papua New Guinea gain independence ? In September 1975, the nation got complete independence from Australia. Who is the Head of State of Papua New Guinea ? United Kingdom’s monarch is the Head of State of Papua New Guinea. What is the highest point of the country ? Mount Wilhelm is the highest point of Papua New Guinea. It is 4,509 meters high. What is Hooded Pitohui ? Hooded Pitohui is the only known poisonous bird which is native to the country of Papua New Guinea. What is the currency of Papua New Guinea ? Papua New Guinean Kina is the currency used in Papua New Guinea. Till the year 1933, seashells were used as currency. Who will host the Pacific Games in the year 2015 ? In the year 2015, the Pacific Games will be held in the city of Port Moresby of Papua New Guinea. What type of economy does Papua New Guinea have ? Papua New Guinea possesses huge reserves of natural resources. However, the exploitation of these resources is being hampered by the terrain and infrastructure’s high cost. Agricultural sector is a provider of livelihood for the majority of the population. Around 72% of the export earnings come from mineral deposits, which include copper, oil, and gold. Manufacturing and the formal labor industry are limited. Budgetary help and support from Australia along with the support of development aid from the World Bank have helped in sustaining the economy. Also, in the year 1995 Port Moresby signed an agreement with the World Bank and the IMF on a structural adjustment program. Which are main exports and imports of Papua New Guinea ? Gold, oil, logs, copper ore, coffee, palm oil, crayfish, cocoa, and prawns are the main exports of the economy whereas the main imports of the country include machinery & transport equipment, chemicals, food, and manufactured goods. Which countries are the major export and import partners of Papua New Guinea ? The main export partners of Papua New Guinea are Australia, Japan and China whereas Australia, Singapore, China, Japan, US, and Malaysia are the main import partners of Papua New Guinea.